Spring is a wonderful time of year. Here in Las Vegas, we enjoy the warm days of spring, without the incredible heat of summer. Wildflowers in the area begin to bloom, and for those who enjoy hitting the trails, this is a truly spectacular time of year. Unfortunately, with the beauty of spring also comes an increase in the number of allergens in the air. If you are someone who finds that your allergies worsen at this time of year, you are no doubt looking for relief in any form you can find. Before you start grabbing for the allergy medicine, check out a few of these tips that will help you fight allergies around your home. Reach out any time for rug cleaning services in Las Vegas this spring to keep your home free of as many allergens as possible. At the change of every season, it is a good idea to check your heating and cooling system’s air filters. These are located throughout your home and act as the first line of defense against dander, pollen, and other allergens in the air. As air is pushed through your vents, these filters capture debris and keep your air clean. With summer right around the corner and already hot temperatures upon us in Las Vegas, your cooling system will soon be in constant use. Make sure that you aren’t circulating dirty air throughout your home by changing out every air filter and replacing it with a new one. You can even invest in higher grade air filters called HEPA filters that will capture more allergens and lead to clearer air in your home. Regardless of what type of filter you choose, be sure you get rid of old dirty filters from winter, and replace them with brand new clean filters for the spring and summer ahead. Often, when we clean our house, we miss a lot of the dirtiest areas of our home. These areas are usually tucked away behind couches, bookshelves, appliances, and assorted furniture. By pulling all your furniture and appliances out of their current spaces, you can deep clean the area behind them. Here you will find a lot of dust, debris, dander, and, for those with pets, pet hair. If it has been a while since you have cleaned behind the large objects in your home, make time this spring to do so. You might be surprised at how much your allergies improve by simply getting rid of dust bunnies behind your furniture. When you are doing this, it is not a bad idea to wear a simple face mask to protect yourself from dust and dander that you might stir up. If the room is carpeted, consider not only vacuuming the area, but also investing in steam cleaning. If the room has hardwood, make sure you thoroughly sweep and mop the space a few times before moving the furniture back into place. For those who own pets, springtime can mean a lot of shedding. As the hotter days approach, dogs, in particular, will be prone toward losing a lot of their winter coat. This can cause your home to be a mess of fur and dander. One way to combat this is to make sure you are sweeping, mopping, and vacuuming any rooms that your pet enters on a daily basis. While cleaning every single day can help, another great way to help prevent allergies is to invest in grooming. Whether you take your furry pals to a professional groomer or you bathe and groom them yourself, removing excess fur frequently can help cut down on dander and debris in the air. This will help keep your home clean and your indoor air quality high. When allergies are at their peak, keeping your home sparkling clean is a must. This will help reduce the number of allergens that are floating through the air. If you don’t already have one for your home, create a daily chores list. Dust furniture, clean floors, and keep things tidy to help prevent the accumulation of dust, dander, and allergens in your home. Get the whole family involved in the cleaning process. From youngest to oldest, assign everyone a few tasks around the house. A little bit of simple cleaning each day can go a long way in reducing your allergies this spring. Finally, last but surely not least, don’t forget to have your home’s rugs professional cleaned. Here at Oriental Express, we provide high-quality rug cleaning services in Las Vegas. We can assist you with cleaning even the most delicate of rugs. 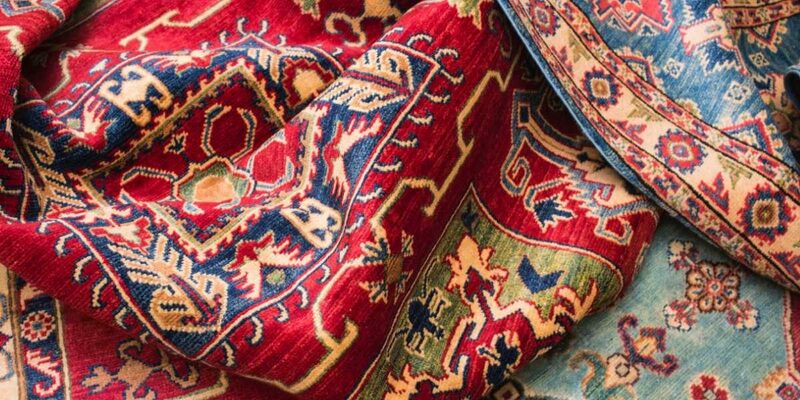 Whether you have a Persian rug, an antique rug, or a large oriental rug taking up an entire room, we can help you thoroughly clean the material without damaging its condition. Cleaning your home’s rugs will help contribute to higher air quality in your home. Rugs often capture dirt, debris, and other allergens throughout the winter months. A quick rug cleaning service will carefully pull all of these allergens out of the rug and will leave you with a beautiful and vibrant rug. If you are interested in having your rug cleaned professionally, we invite you to reach out to our team for further information or to schedule a spring rug cleaning today.